Letter from Dr. Norris W. Rakestraw to LP RE: requests some information about David G. Cantor who has recently submitted an application for employment with them and who listed LP as a reference. [Note in pencil at right: "Freshman- Have asked him to come in." Note in pen at bottom: "3.4 A chem, phys, math Summer."] [Letter from LP to Dr. Rakestraw May 13, 1953] [Filed under LP Correspondence: Box #340, Folder #18]. Letter from P.P. 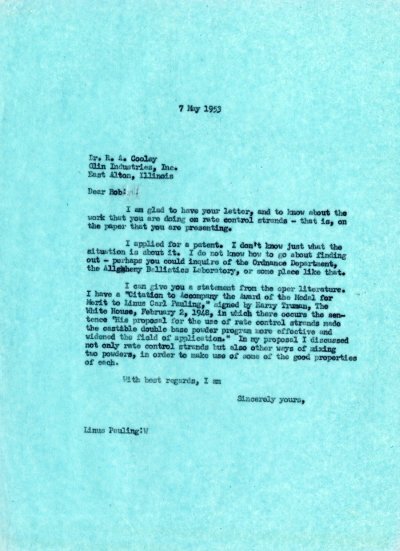 Ewald to LP RE: notices that the review of the International Tables for Crystallography is overdue. Asks whether he can expect the review soon. [previous letter from P. P. Ewald to LP October 29, 1952, following letter from LP to P. P. Ewald May 7, 1953,] [Filed under LP Correspondence: Box #110, Folder #4].